Friday involved a full day of in-person call backs at an old house converted into a casting studio. The owner was a bearded biker that bore a striking resemblance to Jim Dalrymple. After many hours, our group of actors had been whittled down to a handful of selects and backups. It was time for the weekend. The backyard of the casting studio. Our first destination on Saturday was a bazaar in San Angel. This old, beautiful neighborhood only became part of Mexico City’s urban sprawl in the 50s. The bazaar was full of colorful handicrafts and was my idea of a waking nightmare. I promptly fled up the cobblestone street to explore the grounds of the ex-convent of El Carmen. Frida and Diego’s studios. The bridge across the top allowed them to cross to each others’ studios after months of sequestered fighting. I don’t know who this guy is, but his name is all over town. A woman making micro pancakes. I was most excited about our next stop. Xochimilco is what remains of the pre-Hispanic scenery on what was once the southern shore of a lake of the same name. Xochimilco is best known for its canals, which are left from what was an extensive lake and canal system that connected most of the settlements of the Valley of Mexico. These canals, along with artificial islands called chinampas attract both tourists like me and residents. The main appeal: miles of canals and greenery and a chance to ride on charted “trajinera” boats that get pushed like a gondola. We arrived at Embarcadero Nuevo Nativitas when the clouds were dark with rain. 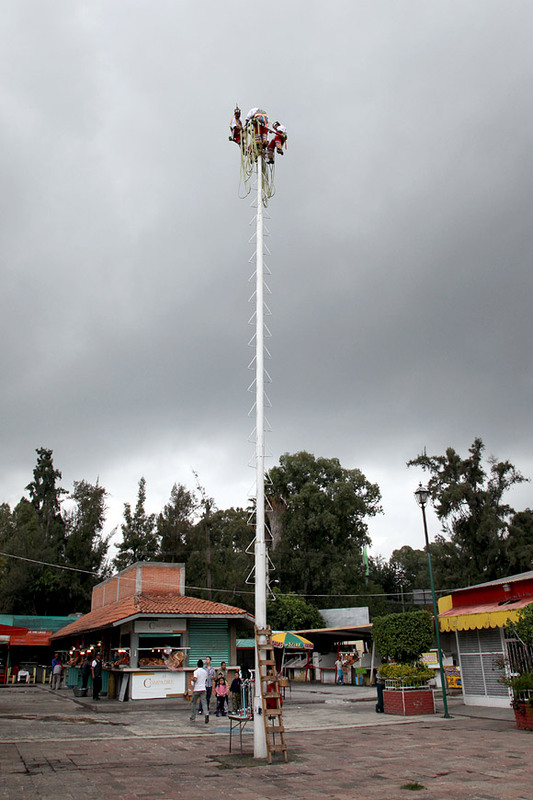 After watching the Palo Voladores defy death on their tall pole, heavy rain began to fall. One myth was that this Mesoamerican ceremony/ritual began as a way to ask the gods to end a severe drought. If so, it still works. We quickly found our boatman. He was friends with our driver, and so no haggling was necessary on the price. Our rate was 350 pesos an hour. To get going, we had to walk through a jungle of boats to one on the outer edge. Once, under the canopy of our boat, we could relax and take in the sulfuric scent of the water near the docks. I was excited to see the “Island of the Dolls” AKA Santana Barrera’s chinampa. But the boatman said it was two hours to get there, making for a pricey and long day. Instead, our boat headed northwest through the canals past homes, farms, and waterside shops. Along the way, we enjoyed the constant passing of other boats that contained revelers, for hire mariachis, xylophonists, and food vendors. Some of the vendor boats even had cooking equipment. The atmosphere was festive with live music and the booming fireworks of landlubber weddings. After an hour on the water we arrived at Embarcadero Caltongo. We turned around and headed back. The rain had stopped and even more people were out. The final stretch was like a game of bumper boats. Palo Voladores getting ready to fly. Crossing boats to get to our boat. Leaving the port in the rain. Tezontle pylons form a supportive wall for the chinampa. Pedestrian bridge over a canal. This doesn’t look like it will end well. A candy apple and potato chip vendor boat pulls up between our boat and another. We bough two bags of chips with hot sauce squirted on top. A row of boats at Embarcadero Nuevo Nativitas . For lunch, F. took us to a terrace restaurant in Coyoacán that overlooked Santa Catalina Church. After lunch, we walked through a neighborhood to Plaza Hidalgo to get ice cream and people watch. My favorite dish: mole poblano. Quesadilla made with Huitlacoche, corn infected with black fungus. Wealth behind the fortress door. Light inside the kiosk at Plaza Hildago. Back at the hotel, we watched the night traffic. Saturday was quite a memorable day. If only I had been born the son of a trajinera boatman. Then I could spend every day pushing boats on Xochimilco’s tranquil waters.